Oklahomans have always had a pioneering spirit. Their ability to innovate and push boundaries continues to be reflected in modern Oklahomans, as small communities are connected to the rest of the world through an advanced technology network that creates unlimited potential for the state. OneNet’s precedent of staying on the leading edge of technology also reflects pioneering qualities and demonstrates immense potential for growth and development. Former state Sen. Ben Robinson formulated the beginnings of OneNet’s network during his travels in the early 1990s. The root idea was to successfully and efficiently connect schools in Oklahoma. Robinson proposed creating one integrated state network that would maximize state-owned and commercial infrastructures. The result would lead to a public-private partnership and would save huge amounts of money for the state. This model led to the creation of OneNet. In 1992, OneNet was created with $14 million from a $350 million statewide capital bond issue approved by voters. OneNet was developed as a division of the Oklahoma State Regents for Higher Education (OSRHE) and became fully operational in 1996. In an effort to become a statewide network, OneNet forged several partnerships during 1996 with Oklahoma’s existing telephone circuit networks. These partnerships helped reduce rates and fees for Oklahomans across the state. Over the next two years, OneNet continued to grow and innovate. In October 1997, Latimer County General Hospital became the first Oklahoma hospital to digitally send X-ray or CT scan films to another location through OneNet. In addition, in the fall of 1998, OneNet was transmitting about 1,000 videoconferences every week. In 1999, OneNet began providing Internet2 connectivity for the major research universities in Oklahoma. Internet2 is an advanced, national networking consortium led by the research and education community. Through OneNet, the Internet2 network became available in May 2002 to all institutions of higher education, as well as career technology centers, K-12 schools and libraries. In 2011, OneNet implemented its first major network infrastructure upgrade. The 2011 upgrade increased bandwidth capabilities from 45Mbps to 100Mbps in some areas and 1,000Mbps or 1Gbps in others. This upgrade was essential to ensuring broadband access across the state in order to meet the needs of OneNet’s customer base in an increasingly digital era. Just one year later, in keeping with both the trend of development and the spirit of innovation, OneNet jumped ahead of the scheduled launch and was the first in the nation to connect to Internet2’s 100Gbps optical upstream network. Internet2 is currently the operator of the nation’s fastest, coast-to-coast research and education network. This new faster connection enables OneNet to offer high-capacity broadband services that expand the computing capabilities of our state’s educators and researchers. Epitomizing the resourceful, inventive pioneering spirit of Oklahomans, OneNet is constantly revising its long-term goals and moving forward with new projects and ideas. On July 31, 2013, the Oklahoma Community Anchor Network (OCAN) became fully operational. OCAN is an optical ring of 1,005 miles of fiber. The network’s 10Gbps connection reaches 35 Oklahoma counties and connects state colleges, universities, hospitals and local libraries, to the state’s existing networks. OCAN offers high-speed broadband services to rural and underserved Oklahoma communities and removes the barriers, creating opportunities for innovation and growth. OneNet completed another ambitious project in 2015 with the deployment of its own 100Gbps network. This build-out is designed as a ring that connects Oklahoma’s higher education research institutions. 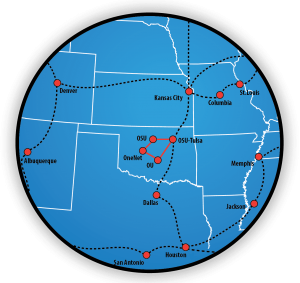 The ring connects Oklahoma State University’s campuses in Stillwater and Tulsa and the University of Oklahoma’s Norman campus to OneNet’s Oklahoma City hub site. This high-speed network is 100,000 times faster than before and will be crucial in enabling OU and OSU to expand their research efforts and partner with other researchers across the country and around the globe. In 2016, OneNet celebrated 20 years of advancing technology across the state. While the network was first established to connect Oklahoma’s schools, OneNet now serves local and state governments, tribal organizations, research centers and laboratories, colleges, universities, public and private schools, libraries, hospitals and clinics, military bases and nonprofit organizations. Looking forward to the next 20 years and beyond, OneNet is focused more than ever on anticipating the growing needs of Oklahoma’s educational and nonprofit community. Enterprise enhancements such as a new billing system and customer relationship management application help OneNet ensure that every customer receives individualized care. In addition, OneNet has made cybersecurity a top priority. OneNet’s engineering team has developed tactics for DDoS mitigation and other types of cyberattacks and continues to educate users on how to prevent and manage attacks. OneNet’s impact is reflected in communities across Oklahoma, OneNet remains hopeful and optimistic about the future. Since the beginning, the organization has held true to its mission: to advance technology across Oklahoma. OneNet’s far-reaching vision is to be the leading internet and network service provider for the state of Oklahoma. Through pioneering the latest technology and advancements, OneNet will tailor every project toward fulfilling that vision. The spirit of innovation will continue to motivate all of OneNet’s planning and strategies and to reverberate throughout the organization.